If you’re a wet shaver, then you already know about RazorRock products and how amazing they can be. The price of performance will get you scratching your head as to how they make such a great product but only charge $5.00 to $10.00 for it. We are all glad they can because some of the best-known shaving soap around have come from this company. I’ve reviewed a few of them in the past and the one for today will be Son of Zeus. This soap has seen many changes over the years not only to its formula (Vegan & Tallow versions) but to the redesign of its label. I happen to have an older version which was part of a luxury barber box. This was a special tallow version which I have to say I didn’t really notice the difference. To me, the performance was the same. Ever since I’ve been creating shaving soaps people have been asking me “Does your soaps have tallow?” like it’s some magic ingredient of which without you’ll never have a close shave. I say just try one of my soaps and tell me after if you think tallow is necessary. I’m sure I can change your mind. I’ve noticed most artisans will start out as vegan and then slowly add a tallow based line and eventually drop the vegan. This, of course, comes from the pressure of the wet shaving community. Once something is said and believed to be true there is no changing it. The packaging is the common black plastic tub with translucent inner top and a black screw on lid. The label design has changed since I got mine and I happen to like it. It shows the face of Apollo which is the Son of Zeus a better representation of the product than the prior one. The scent is a fantastic orangey peppery blend the website describes it as a "Powerful orange spice with an earthy undertone." I think its much more than that but Razorock tends to not give too much away when it comes to describing its scents. As far as the lather goes, well, how can you beat this product. The bowl lathered up as soon as your brush starts. It’s not long before you have a rich, thick and creamy lather that gets right into the beard. The slickness and glide have always been top rated and this was no exception. I was able to go over trouble spots with no fear of irritation. The post shave feel was a good one as well. 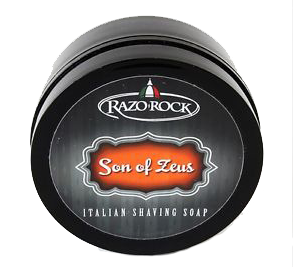 You can’t go wrong with Razorock and if your new to wet shaving please do yourself a favor and head on over to https://www.italianbarber.com/ here you’ll find an amazing amount of hardware plus shaving soaps for under $10.00. So, what are you waiting for!